Reyes, 48, coordinator of Sandigan ng Manggagawa sa Quezon City and a former organizer of government employees was illegally arrested June 2 last year while on his way home from a meeting with workers from Quezon City. He and his companion were forcibly taken in a vehicle by four men. They were blindfolded and a gun and a detonation cord was allegedly planted on his small pouch. His companion was left off on the way with the abductors saying he was not the target. Reyes’ whereabouts were unknown for almost 12 hours until he was surfaced in the Criminal Investigation and Detection Group detention area in Camp Crame. 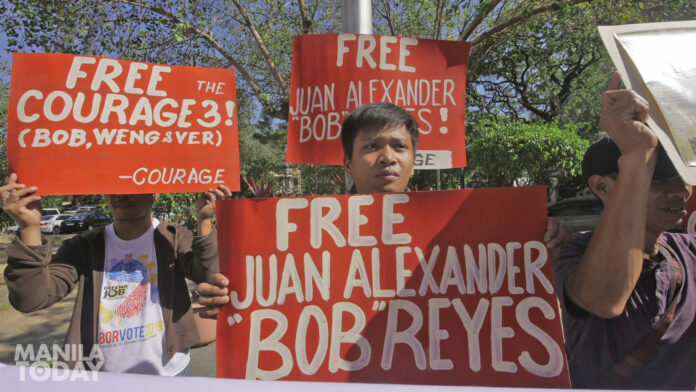 Around 500 political prisoners now still languish in congested jails, charged with common crimes, according to National Union of Peoples’ Lawyers counsel Atty. Kristina Conti.